Two student fencers are making waves in the sport. There is more to fencing than meets the eye, according to two students making waves in the sport that has taken them to competitions around the world. Patrik Dula and Adam Nazarali have represented Canada at fencing competitions across North America and, most recently, last October's World Cup in Leszno, Poland. 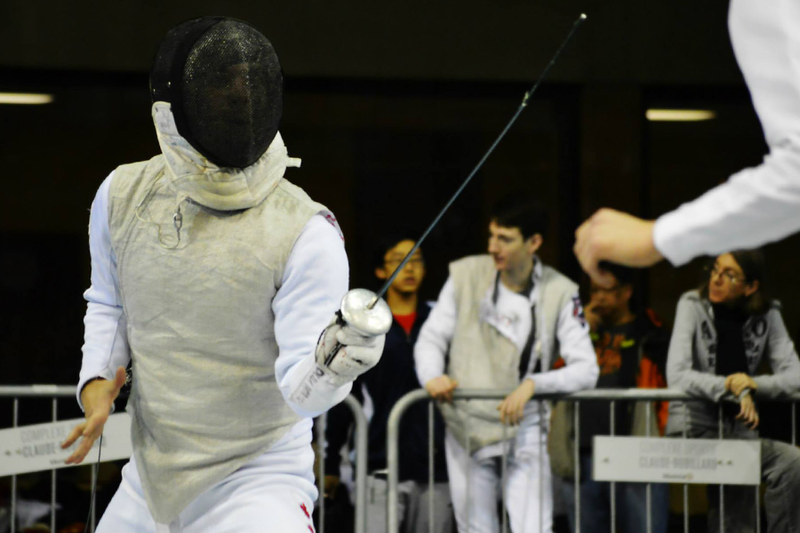 Nazarali, a first-year student with the Edwards School of Business, started fencing when he was six years old. Within a year of joining the Saskatoon Fencing Club, Nazarali started competing in local tournaments, followed a few years later by provincial competitions. Dula and Nazarali in their fencing gear. Dula, who is originally from Romania and in his second year at Edwards, also started fencing when he was six, at the suggestion of a family friend. "A lot of people call it physical chess," said Nazarali. "You have to think about what the other person is doing at the same time. Whatever I'm doing, it's either a reaction to what the other person is doing, or what they're doing is a reaction to what I'm doing." That back-and-forth is a big component of his fencing strategy. "The first five or six hits are just usually figuring out their style; how the other person fences and what you can do to counter what they're doing," he said of the matches. "It's really short." Canadian Fencing championship, while Dula was a silver medalist at the Pan-American Junior Cadet championship in Puerto Rico in 2013. That same year, they represented Saskatchewan at the Canada Summer Games, held in Sherbrooke, Que. Both Dula and Nazarali agree that the opportunity to travel and compete with others on a global stage is a big perk. Additionally, the discipline and control required to become a proficient fencer is something Dula has applied to his everyday life. "It's a gentleman's sport," he said. "If you're angry in hockey, you can get in a fight. In fencing, you can't do that, no matter how angry you get. You have to go and shake the opponent's hand at the end of the match. That's huge." Both also have big aspirations for their fencing careers. For Nazarali, this involves making the junior national team next year, but first, he has to perform well at a qualifier match in Montreal in May. Dula, meanwhile, has his eye on some rings. "The long-term goal is the Olympics," he said. "It's going to be a lot of work, but it's motivation to work harder."